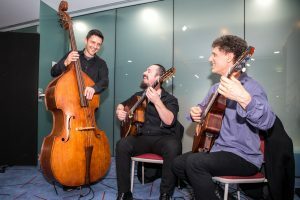 Double bassist Sarah Clare enjoys playing a diverse range of musical genres and has performed in many different ensembles nationally and internationally. Sarah comes from a classical background, and after completing her Bachelor of Music at UWA, (First Class Honours), Sarah received a scholarship to further her studies at the Sydney Conservatorium, completing the Post Graduate Diploma in performance. Sarah then won the double bass position in the Sydney Symphony Orchestra Fellowship and continued to work casually with the SSO, as well as the Australian Opera and Ballet Orchestra and The Tasmanian Symphony Orchestra, Sarah is now based in Perth. 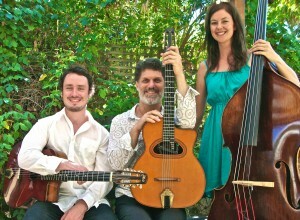 Lachlan Gear is an accomplished jazz and contemporary guitarist. After first cutting his teeth in the blues and rock scene while still at school, he then went on to study Jazz at the Western Australian academy of performing arts. He has since performed in ensembles that range from traditional jazz, modern jazz, Latin, bossa nova, and gypsy music through to pop, blues, funk, and rock groups. 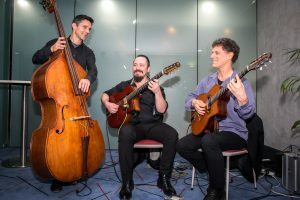 For the last few years he has been dedicating himself almost exclusively to the school of gypsy jazz, founded by Django Reinhardt and carried on by modern masters such as Bireli Lagrene, Stochelo Rosenberg, Adrien Moignard and Sebastien Giniaux. Recent accolades have included an invite to play in Brisbane as part of the Ozmanouche festival, as well as being a headline act at the Gypsy Jazz Playmakers festival in Albany as part of the Perth international arts festival.